The NewTek TriCaster TC1 Base bundle is the essential solution for modern video production. 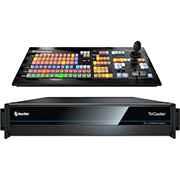 With industry-leading, software-driven live production technology; a 16-input, multi-source video workflow with out-of-the-box support for four SDI hardware inputs; and an included 1.5-stripe control panel with 14 source buttons, the NewTek TriCaster TC1 Base bundle provides everything you need to create more incredible content, make it available in more places, and reach viewers—whenever and wherever they watch. Produce amazing content with hundreds of advanced production capabilities for video switching, playback, mix effects, graphics, audio mixing, virtual sets, and more. Deliver an immersive viewing experience for programs, performances, events, and sports with native support for true 4K Ultra HD resolution at 60 frames per second. Present your video as it was meant to be seen with NewTek’s software-driven processing maintaining native resolution of every signal from input to output. Create compelling content using any combination of compatible SDI and IP video sources, including local and remote cameras, mobile devices, Skype video calls, computers, streaming media, video files, graphics, and more. Produce content for any screen or schedule, with SDI and IP live output, multi-channel recording, multi-platform live streaming, social media publishing, and more.